I hear Indianapolis has Chestnut Praline – I am hoping to go try it! But that Cherries Jubilee Mocha sounds absolutely fantastic!!! Melody, glad you were able to get a few pictures of the test drinks. Dylan, I’m in the Indianapolis area and the store on East Washington St. has had the Chestnut Praline since Nov. 1st. Hope you get a chance to try it. It’s definitely not as sweet as some drinks so not as dessert like, even with the whip. I live a few hours south of both Tampa and Orlando, but will definitely be on the lookout for the Cherries Jubilee Mocha when I’m in Orlando next month! Melody, I think chestnut praline would be more my taste. I’m definately hoping we get to keep gingerbread latte!! I’ve heard the eggnog is more popular… Hmmm wonder if that’s true? I knew Florida didn’t have gingerbread latte because lots of people have complained on the company Facebook page. Hoping they take note and keep gongerbread. I live in Orlando and so far have run into one store that has Cherries Jubilee instead of Gingerbread (the Starbucks inside Epcot at Disney, I will check the one at Magic Kingdom tomorrow). Next time I see it I will try it and let you know what I think. Very interesting! I could never see forgoing gingerbread or eggnog to replace for one of these. 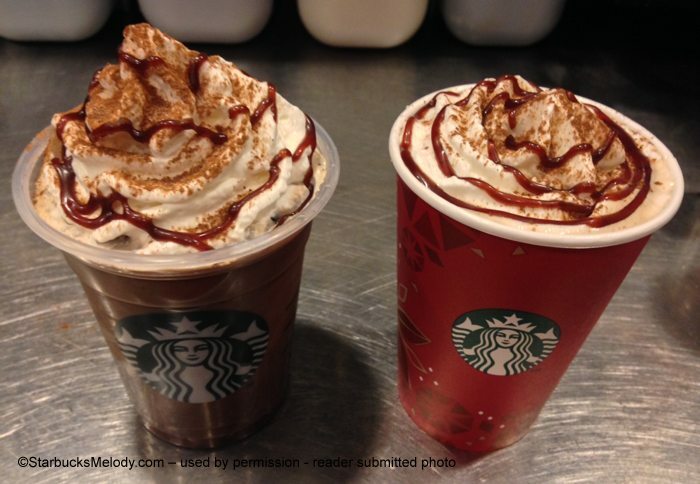 The cherry mocha would be a good winter two drink in my opinion. It will be fun to watch the progress! They both sound so uniquely wonderful! Nothing is better than peppermint mocha though. I seem to always go back to it. 🙂 Mmm! The Chestnut Praline crapfest is being tested all over Maryland, Annapolis, Crofton, and Bowie. They have replaced my favorite eggnog latte with this disgusting new drink. It is absolutely terrible and u don’t understand the decision to get rid of a customer favorite to test a new product. Why can’t we have both? Thanks for ruining my favorite time of the year Starbucks. What did Maryland ever do to you? Tried the Chestnut Praline Latte today here in Greenfield, Indiana. It’s amazing. As others have described, it’s less sweet than other similar lattes (toffee nut, hazelnut) and much more nutty, but it’s very balanced and smooth. The staff raved about it and the guy who rung up my order said it was his all-time favorite latte! They weren’t selling Gingerbread Latte this year because of the test. Chestnut Praline will be available in some parts of Michigan too. @Maureen – I can respect that this drink isn’t for you. 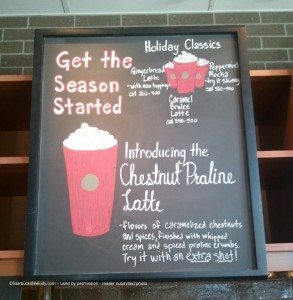 You don’t like the Chestnut Praline Latte, and I can see how it would be disappointing not to find a returning favorite holiday beverage. I can only say that taste is totally subjective. Just because you don’t like it, really doesn’t suggest whether it’s a drink that will work on a national scale. That’s why there are so many tests all that time (or one of several reasons – tests also are a check on whether the drink can easily be operationalized and still maintain speed of serve, and also to check to make sure that profit margins really are as estimated) – There are so many tests because some people will like it and some people won’t, but it takes a lot of testing to figure out if enough people will like a drink to make it work on a national scale. Thanks for weighing in. @Johnathan – I wish I had the Chestnut Praline. There hasn’t been a true nutty syrup (more nutty than sugary) since almond, imho. Thanks for weighing in. BTW, 3 other stores I frequent in Orlando do have Gingerbread and no Cherries Jubilee, so Gingerbread fans (like me!) are not totally out of luck. @Melody thanks for the dissertation on how product testing and taste works. If you actually read my post you would know that I’m not against testing products but against sacrificing a drink that is liked by many and only available one time a year for the sake of testing a new drink. There is absolutely no reason they can’t sell the regular holiday drink while testing a new one. If you’re going to operate a forum asking for opinions on a topic, I would recommend that you not attack people for sharing their opinions that oppose yours, especially while lecturing them about taste being subjective…a little hypocritical, no? My store is in Orlando and has the Cherries Jubilee Mocha and it is fantastic and customers are really loving it. We do miss the Gingerbread Latte, but in order for it to be a true test to see if Cherries Jubilee will outsell Gingerbread the latter was removed from the holiday line-up. We still have Eggnog Latte though! @Maureen – I didn’t mean to offend you! I realize that lots of articles will have some kind of tension to them. You sounded pretty angry to me – at least that’s the way I interpreted things like “crap fest.” I welcome your opinion, and told you that I respect what your tastes are. I’m sorry the beverage you like didn’t come back. I can’t explain why. All I can do is tell you that I am sorry that the eggnog latte didn’t return in your neck of the woods. I get it. Since this site is truly just a small, fan-operated blog, maybe you could call Customer Service and tell them what you think? Hearing feedback on the beverages isn’t a bad idea. @Maureen, I can only assume by your original comments (which were a little nasty in tone), that perhaps you have no ties to the the company, other than that of a customer. From a company perspective, Starbucks pushes out test products all over the country all year round. In many cases a “less popular” drink is typically replaced by one of these test drinks. Since neither of the drinks referenced in this article are featured in my market (Southern California), I have not had the chance to try them. The drinks you refer to as being your personal favorite, clearly were not hot-sellers in your market…Starbucks will take risks on new drinks, but at the same time they are a business and are not going to remove a hot-selling seasonal drink if the dollar figures are there to support it. The best way to let Starbucks know how you feel is to contact their customer support center….getting upset with a group of fans on a blog won’t bring back your beloved drinks! I’ve been a manager in markets where we’ve tested many beverages, it really is a difficult balancing act. One thing customers don’t really understand is how difficult it is to just add extra drinks to the menu. There is limited storage, limited counter space (just look at our bar area right now: still have pumpkin sauce, caramel brûlée sauce large bottle, two extra regular syrup bottles for gingerbread and SF peppermint, extra shaker with pumpkin powder, two new shakers for chocolate curls & caramel brûlée pieces (plus still have salt for salted caramel drinks), plus the new drizzle bottles for molasses) for new items, plus fridge space to accommodate egg nog. 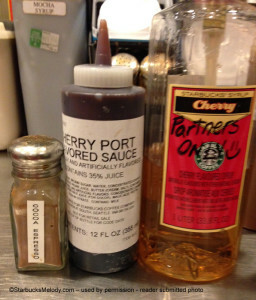 It’s crazy to think we can keep all these current ingredients plus handle new ones for a test beverage. Those types of decisions are make or break for speed of service, and the holidays are definitely not a time I want to slow down any more that absolutely necessary. I’m sorry for those customers who have lost their favorite beverage, I agree with Melody’s comments that you should definitely call or write Customer Service. But the most likely way you’re going to keep your favorite items around is to vote for it with your pocketbook. Odds are, the regular beverage that was removed was one of the lesser selling ones in your area. You can talk all you want about it being your favorite, but if you and your neighbors aren’t buying that particular beverage, it might go away some day. I definitely can sympathize with the baristas for the lack of room. I can see how all these new additions and WCs can make for less room to create! That being said, I shamelessly admit I am a huge fan of the spiced whipped cream! I was never a huge fan of the Gingerbread latte, but with the new molasses and spice wc it is Wonderful! It is really sad when you lose a favorite, I can certainly understand that….I really miss the non La Boulange pastries, and I wish they would come back too. I did mention it on MyStarbucksIdea..but I know sometimes the changes are here to stay. 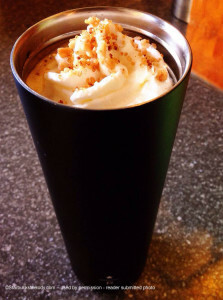 I can’t imagine the Eggnog latte would be gone forever…I’m not an Eggnog fan at all, but I bet it would be good with the spiced whipped cream, for those that do like it. Maybe alternately you can talk to the DM or SM at the store? Oh! or Target and licensed stores tend to have the standard offerings…so maybe they have it still. Also, a friend and fellow blogger that is in FL right now, had the Cherries Jubilee Mocha and said it was fantastic 🙂 Sounds good! @Maureen: I’m not with Sbux and I’m also not Melody, who delivers tons of news and info re Sbux when she has no relations with them…other than doing the company this HUGE service because she’s a Sbux fan. Your lines, however, were way out of line….”imo”. And your ‘tone’. You wrote your posts as if Melody were responsible for these drinks and test markets. I have been a Sbux die-hard for over 20yrs. Lots of changes in Sbux thru those yrs. I have hated many of them but I would never assume any individual (other than maybe H.S.) was ultimately responsible for them! There also are many things I wish Sbux would bring back….I think overall it was much more what I liked, as a COFFEE shop, back in the ’90’s. But, that doesn’t matter. I urge you to voice your comments to Customer Service or, go to MSI. But, Melody is certainly NOT responsible. I just want to thank Denise R, Heidi, and anyone else that helped back up Melody on this subject. I was shocked to see the comments from Maureen and do hope she contacts customer service since she is so upset about not having her favorite drink this year. I’m excited to hear that the Chestnut Praline is in Greenfield and do love that store. Will be making a trip that way soon. Thanks for the info, Jonathan! @Becky E – What a small Starbucks world it is – I am amazed that Jonathan was writing about a store that you knew. I’m always sort of amazed when there are multiple customers of one store reading here, if you know what I mean. would love to try both new flavors! I must admit that I have never tried the eggnog or the gingerbread before, since I am new to the world of Starbucks! But the one thing that I love, and look forward to is the new products, because we know that the seasonal flavors usually come back the new make it even more fun to plan a trip to Starbucks! and for me it is a trip since the nearest one is over a 40 minute drive! I really wish we had the Chestnut Praline in my neck of the woods, it sounds delish. I work at a Milwaukee store, and we are testing the chestnut praline, but also have the gingerbread and the Carmel brûlée back. It’s really good with the new spiced whip that goes on the gingerbread latte and a lot of people are saying the chest bet tastes like golden graham cereal milk. It’s sweet, but not too sweet. Very good! Sorry, I meant we got the gingerbread, eggnog, and Carmel brûlée back, but are also a test store for the chestnut. Is the chestnut praline a standard syrup or more of a thick sauce? A couple of years ago there was a “Dark Cherry Mocha” which featured a clear cherry syrup. I miss it and wish it would come back. For those that remember this and have access to the Cherry Jubilee Mocha, how do they compare? The syrup looks colored for one. 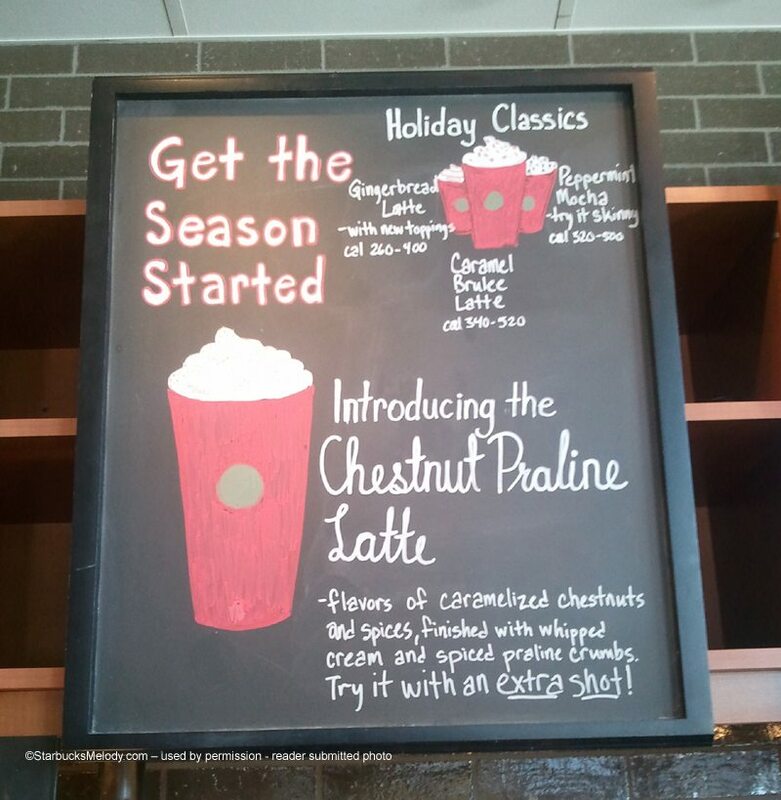 Last year we were a test market for the cranberry white mocha. That was delicious and I’m sad to not see it come back. Cherries Jubilee Mocha available in both downtown Orlando locations (Grand Bohemian and SoDo). It’s awesome!! As Nicole, Ricky/Rickey mentioned, there will be eggnog* lattes, so no need for angry customers. (*Disclaimer: Unless there are still exceptions in test markets). To those affected, I say life is short, and count your blessings. Note: Starbucks is expected to have a ‘Share Event’ in participating stores (U.S.) Nov. 13-17 from 2-5 p.m. – Buy one holiday beverage, get one free (Gingerbread Latte, Caramel Brulée Latte, Peppermint Mocha, Skinny Peppermint Mocha and Eggnog Latte). Addendum: Melody also already mentioned that eggnog was coming back in a previous post (http://www.starbucksmelody.com/2013/10/31/starbucks-gingerbread-latte/), but it hasn’t surfaced in my area. The other holiday drinks have, but hopefully today it will finally be available (I am not in the test market). I wonder why the salted caramel mocha is not included in the bogo since it’s not available year round? The chestnut praline is available in parts of Missouri too. Haven’t seen the cherries jubilee though, and I’d love to try it! @Becky…the Salted Caramel Mocha is not included in the BOGO because technically speaking, it along with the Pumpkin Spice Latte are considered “fall promotional” drinks and not “holiday promotional” drinks. The BOGO is for the “holiday” line up. Tried the chestnut praline at a Baltimore location and I LOVED every sip of it! I might need to switch to this every single day to make the most of it in case they don’t bring it back! Thanks Heidi, that makes sense. 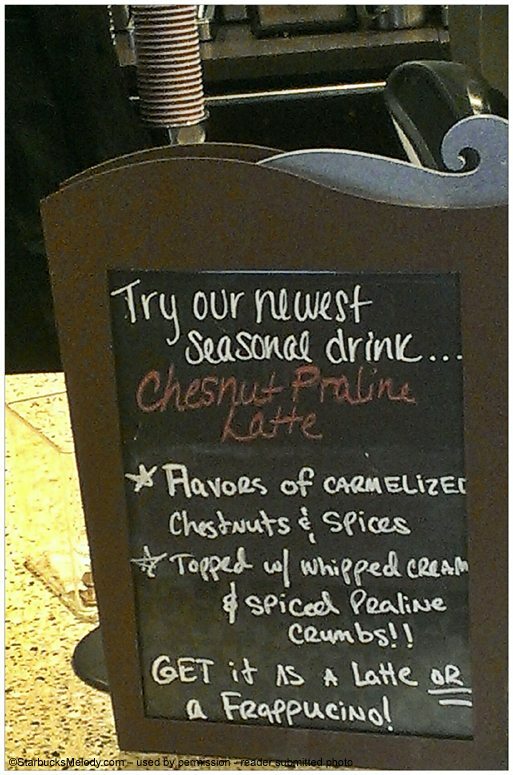 Dang it, it is official, my area does not have the wonderful sounding chestnut praline latte. I was holding on to the slim chance that since today was the official launch of holiday, that we might have it. Oh well, I hope it does well so I might be able to try it next year. Also concerning the BOGO and the salted caramel mocha, it’s odd because my local SB still has the SCM on their menu, and they already have switched over to the red holiday menus. I hope it does qualify for the BOGO because that one is yummy. I am in the VA beach area & walked into the sbux store to get my pumpkin spice but noticed the chestnut. Got it instead, &super in love! 🙂 agree that sbux needed more of a salty taste/nutty like the almond, & this drink has exactly that. Thanks! The Kwan–Also Target will have the BOGO event until November 21s. Also, thanks to everyone who defended Melody! @The Kwan–Also Target will have the BOGO event until November 21s. Also, thanks to everyone who defended @Melody! The Chestnut Latte is the worst thing I’ve ever had at Starbucks. It tasted like an ashtray. The salted caramel and pumpkin spice are included in the bogo (it’s called out in the holiday workbook, as well as action items on the portal), even though they are, as Heidi called out, fall promotional beverages. I *am* in Canada, so it *might* be different, but I’m fairly certain it was not called out for Canada only. 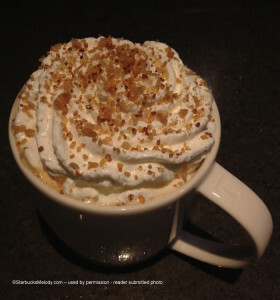 The Chestnut praline latte is in the Kansas City area and it is sooooo good!! I can make a s’more frappuccino with soy milk, a pump of mocha and the chestnut syrup and let me just say hold onto your seat cause it will make ou take off! The Chestnut Praline is in Mechanicsville, Va.. I tried it today and OMG it is Fantastic..It almost has a taste to a snickerdoodle. I hope they will keep this one for the holiday seasons, because it is real good. I added a little Starbucks mocha powder to my Chestnut Praline when I got it home yesterday since I’m very much a chocolate lover. It was really good! The Rochester, MI Starbucks (in the Village of Rochester Hills shopping center) has the chestnut praline latte. Cherries Jubilee Mocha ROCKS and I do not like our sweet drinks. Barista love! I should say “normally do not like” — this one is sooooo good. am drinking my first chestnut praline latte. love it. it is less sweet than my usual peppermint mocha and has more taste than a regular latte. I’d be interested to try the chestnut praline drink!